Your mattress is one of your most important possessions. You spend approximately a third of your life sleeping, so it’s worth investing in a great mattress. Selecting the perfect mattress can mean the difference between waking up refreshed and having to trudge through another long, sleepy day. Your choice is especially important when you suffer from allergies. When you’re ready to choose the perfect mattress, there are three big things to consider: softness, support and size. While these characteristics are a matter of preference, memory foam technology now provides sleep support that responds to and releases pressure points while providing individualized comfort. For allergy sufferers, memory foam also provides welcome relief from sleeping on irritants and triggers. Dust tends to build and collect in the coils of a coil spring mattress. With dust comes dust mites and their feces. That can cause headaches, sneezing, itchy eyes and respiratory problems. Memory foam mattresses don’t have that problem. In addition to not having the drawbacks of coil springs, memory foam mattresses are made from natural ingredients and infused with blowing agents to increase carbon. That gives memory foam more natural allergen fighters than traditional mattresses. Memory foam is compact and created so that dust mites don’t have a chance to move in and take up residence in your mattress. Some people prefer to sleep on a bed of pillows. Other people prefer a mattress that feels like a rock. Your body type, weight, height and preferred sleeping position can all impact your choice for softness. You want a mattress that’s your desired level of softness, but you also want to choose a mattress that offers adequate support. Even a soft mattress should offer enough support, so that you don’t end up with pressure points on any one given spot while you sleep. Inadequate support like the kind you find with coil spring mattresses can lead to waking up during the night or waking up with pain in certain spots. If you have back or shoulder pain, you might need more support than people without these problems. Making sure your purchase has the right support for your needs can spare you this problem. Do you need a twin, full, queen or king? This decision should impact your budget, because larger mattresses are more expensive. Because a mattress is a significant investment, you should think about what fits your space and your personal preferences. Engineers developed memory foam in the 1970s in order to improve cushion safety for astronauts. What they actually discovered revolutionized smart sleeping. Memory foam responds to your pressure points, while coil springs simply rebound your weight with the same amount of pressure. By releasing your pressure points, memory foam distributes your weight evenly so that you get a restful night’s sleep. Memory foam mattresses offer more body contouring than coil spring. If you want to feel like your mattress hugs your body and releases tension, memory foam is your material of choice. Developing technologies have also made memory foam cooler than ever before, so it provides comfort while it releases pressure and relaxes the sleeper. What’s more, technology advances continue in the world of mattresses. Savvy sleepers can now choose between traditional memory foam and natural memory foam. Instead of using petroleum, natural memory foam uses soy or cedar oil instead. For the environmentally conscious, this is a welcome change. This latex model is both comfortable memory foam and responsive to your movements. The mattress is 10 inches thick with a 3-inch natural latex comfort layer. If you want a responsive foam mattress that sleeps cool, this is a good choice. If you have problems getting out of bed or moving around lying down, the responsiveness of this mattress can help. 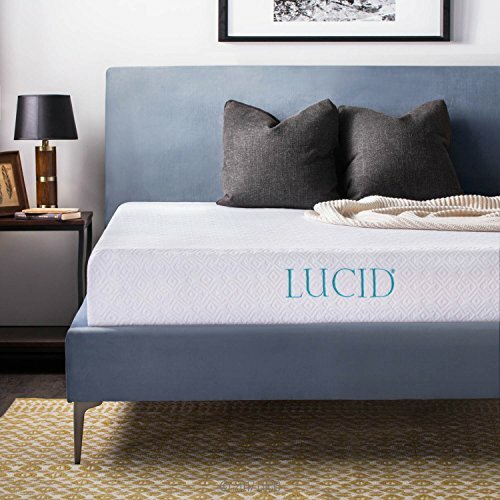 LUCID ventilates the latex in order to make it even cooler than the mattress would be naturally. There are also 7 extra inches of support foam. Because of its natural latex components, it’s resistant to allergies and other irritants. This mattress feels on the firm side compared to other mattresses. It’s a solid model that sleeps cool and responds to movement. If you like to sleep cool, this model is a good choice. You get the benefit of a nice, bouncy material that responds to your movement quickly, but it also has the comfort and pressure relief of memory foam. 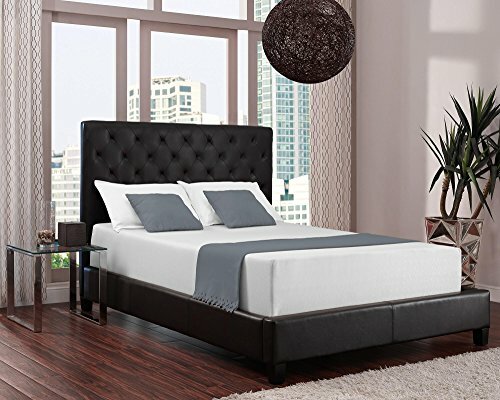 This is a good choice for sleepers who want a great deal of solid support along with a responsive mattress. The Snuggle-Pedic mattress prides itself on breathability. It has both ventilation holes and ventilation channels, so that you don’t get overheated as you sleep. The top layer is designed to be soft and cool, while a lower layer offers firm support. It’s also hyporallergenic, and it resists dust mites. For allergy sufferers, this model comes sealed in order to keep out allergens that might want to sneak in during transit. You also have 120 days in order to try out your mattress to make sure it’s everything you hoped for. 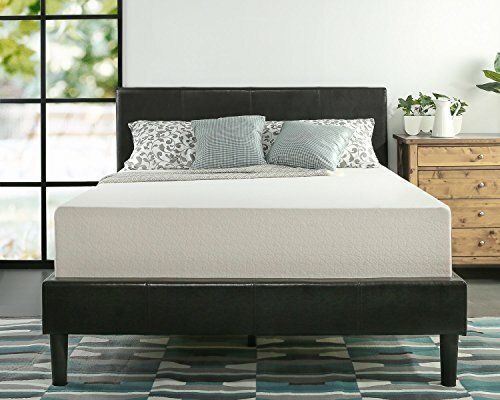 While this mattress doesn’t completely replicate the traditional memory foam experience, if you want a balance between the contours that memory foam offers and the ability to shift your weight quickly, the Snuggle-Pedic is a viable option. This mattress has its unique features, but it tries to be both soft and firm at the same time. It may make more sense to prioritize whether you want ultimate comfort or stronger support. It’s a good mattress for allergies, because it has some qualities that help fight allergens and dust mites. Also on the plus side, it’s more bouncy than traditional memory foam. The Zinus model stands out because it places a comfort layer in between the memory foam and the person sleeping. However, if you’re a fan of memory foam and comfort, this is a great choice. That’s because the Zinus provides several different layers of foam that vary in memory and comfort, so that you have a comfortable memory foam experience. For allergy sufferers, the mattress comes infused with green tea and castor oil. That helps it naturally reject bacteria and other irritants. The soft-knitted fabric is both durable and comfortable. If you want a sturdy mattress with both comfort and memory foam, this Zinus model fulfills these requirements. If the thought of green tea and castor oil relaxes you, it’s also a good choice for that reason. Although it has some components to naturally fight bacteria, it may not be as resistant to allergens as other models. When comfort with memory foam is your top priority, you should seriously consider this model. If you plan to share a mattress with someone who tosses and turns, this Signature Sleep model is a good option. It’s also one of the firmest and most supportive models available. The memory foam is sturdy, so it conforms to your body as you sleep. It’s a good model for side sleepers. It has 3.5 inches of memory foam on top with 8.5 inches of high-density foam underneath. The mattress has materials and components that are flame retardant and pollution free. This isn’t the pick if you want to crawl into a plush bed. 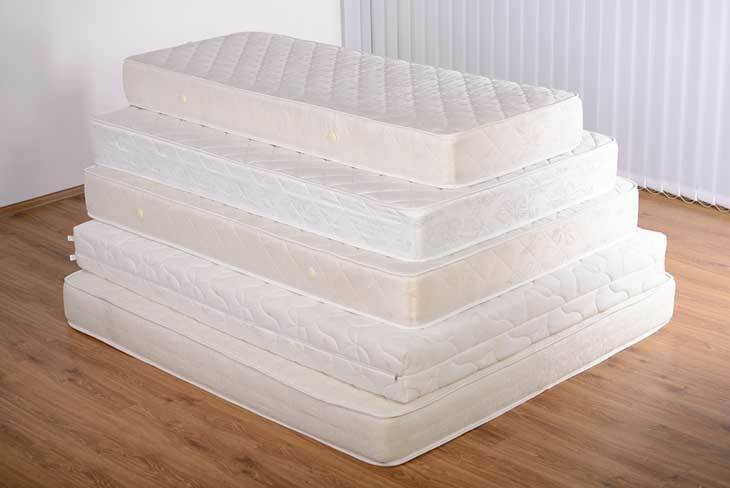 However, if you have health problems that require specific support, this mattress can provide the support that you need. It also comes in lighter than other available models, so if you need to move this mattress a significant distance, it can meet your need. Ultimately, this model has stronger memory foam support, so it’s the best choice if that’s what you’re looking for. This bed has a gel-infused top layer of ventilated memory foam. That can make it cooler than other memory foam models. However, this layer is 2.5 inches, and the base layer of support underneath it is 7.5 inches. That isn’t as thick of a support layer as the Signature Sleep model. That may also mean that it wears out faster than other models. Even so, its fabric cover is a sustainable, Tencel blend that repels moisture. It may not resist odors as well as other models that have specific components to do just that. While the gel-infused memory foam is an attempt to offer cool memory foam comfort, this comparatively thin mattress has its drawbacks. 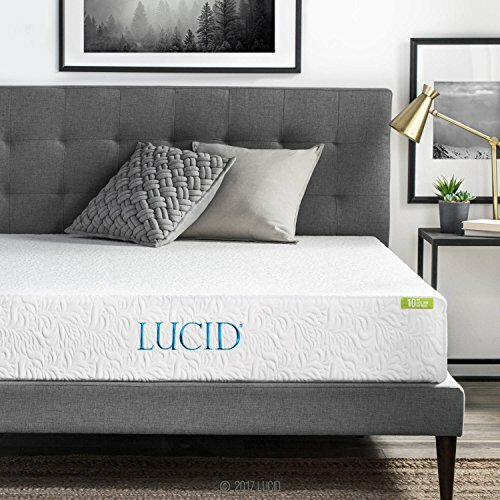 This LUCID Gel Memory Foam Mattress tries to tackle the issue of memory foam mattresses sleeping hot. However, this model doesn’t quite hit the right combination of features. If you want to sleep cool, choose something besides memory foam. The gel is a patchwork to appease cool sleepers, but ultimately there are better models on the market if a cool bed is on the top of your list. Weighing all of the options, the Zinus Memory Foam Green Tea Mattress offers the best combination of support and comfort. Memory foam mattresses offer relief from pressure supports, but it’s also important to have a comfortable mattress that invites relaxation. When you stretch out on the Zinus model, you can breathe a sigh of relief and comfort. Although the Zinus mattress stands out, each of the mattresses is a dependable choice for allergy sufferers. However, if the most and strongest support is your top priority, choose the Signature Sleep model over the Zinus memory foam. The Signature Sleep model has a thicker support layer than the Zinus model, so it’s likely to offer more support and last longer. Consider your personal priority and preferences, and then choose accordingly. Pleasant dreams!